This practical backpack is a close to the body enclosed track pack with versatile unit size, stretch comfort and volume expansion. The hose routing under the arm allows a shorter way to the mouth for easy hydration. The removable water bladder sleeve is made of insulated materials for faster filling. Adjustable Sensi - shoulder area: For all body sizes suitable shoulder adjustment system for a perfect fit. Through the velcro system allows you to easily adjust to the sizes S to L.
Soft Trims: no buckle, no straps. All Trims prevent friction and chafing for added comfort. Twin Link: It ensures an easy and simple adjustable adjustment system to avoid pressure points on the sternum and increased breathing comfort. Sensi compression: Innovative, adjustable design for load stabilization on the back while running. Enlargeable/erkleinerbares Box: The on the required volume can increase or decrease the pocket. 2 chest pockets: Made out of elastic power mesh chest pockets can even accommodate a water bottle. Bite valve with on/off system: The user-friendly, leak-proof bite valve for easy hydration and soft komtakt in the mouth. Soft 1.5 liter hydration bladder - free of PVC, phthalates, bisphenol A: From Hydrapak developed - by the FDA (the U.S. Pharmacopoeia and Food and Drug Administration) approved polyurethane. Sensifit: Innovative design using soft, stretchy materials that adapt to the body. Allows a tight fit of the equipment and comfortable breathing. Patent pending. Motion Fit Trail: This new design allows the backpack to follow your body movements - for more comfortable carrying the load, and for more flexibility in movement-intensive sports. Whistle: Salomon backpacks are equipped with a whistle for safe trail running. 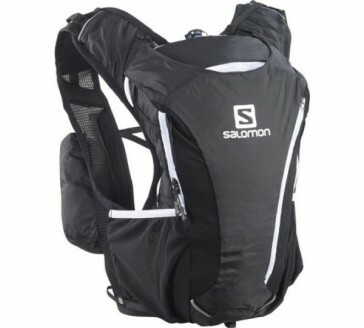 It is securely attached to the backpack and easy to handle. Reflective: Increased visibility for greater safety. Quick wicking materials: These lightweight materials dry quickly, provide better moisture management, optimal comfort and prevent unpleasant smells. Elastic Powermesh: Extremely elastic and breathable material that adapts to the body shape. 70D Tassar Semi Silicone: Very lightweight fabrics with silicone coating for better resistance to weathering and ripstop fabric for higher tensile strength. 2 side cargo pockets: The two made ? ?of power mesh side pockets are expandable for storing important items. Thanks to the compression straps everything stays securely in place. 4D pole holder: easy handling, fast and easy access to the sticks while running. Can also be used for helmet attachment. For ease of application in 4 steps: 1 - Remove the upper belt and insert the upper floor. 2 - Turn the stick to the back. 3 - The lower floor of the lower strap mount. 4 - upper lash strap to secure the floor. Front pocket: Is it easy to push to the waist belt and can be attached to the light, concealed buckles at the shoulder. Water bottle holder: Easy to be placed onto the shoulder or waist belt.